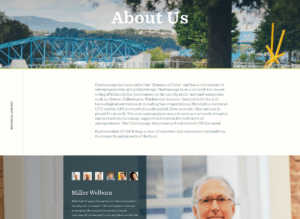 Your ‘About Us’ page serves as a chance to separate your brand from others in the field by telling your viewers everything they need to know about your company’s outlook, aims, and history. Unlike every other page of your site, this section doesn’t necessarily have to talk about your products or services, it’s a chance to highlight your attitudes and culture. Known for being the world’s leading email marketing platform, MailChimp’s about us page gives us a friendly, casual vibe. 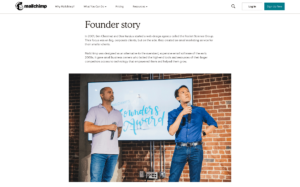 The page starts with the image of its founders as shown above before going into brief details about the company story, the team, and their plans for the future. As I’m sure you’ll notice, the first heading after the main story is “culture”. Explaining how your company likes to work does two things, it lets customers know you’re one of the good guys, and potential partners or employees know that you’re worth their attention. MailChimp has a done a great job of humanising its brand by splashing an array of casual looking photos. This helps to put faces to its workforce as well as makes the brand far more relatable. If you like a GIF, you’ll know all about Giphy. 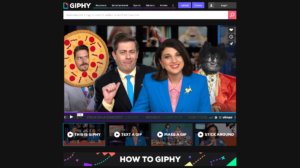 At the very start of the page, Giphy present users with a set of videos. Not only does this make the page incredibly entertaining, but it also plays right into their brand message. We’re introduced to the brand, the idea of GIFs, and the best ways to go about making a GIF within minutes of very easy viewing. They don’t have to brag about a specific culture in detail here, as every second of every video on the page tells you everything you need to know – they’re all about fun, embracing internet pop culture, and aren’t ashamed to sell the living daylights out of their chief product. 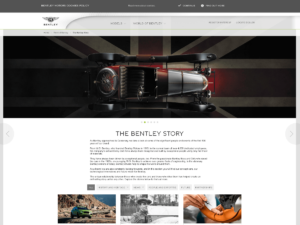 Bentley’s elegant ‘About Us’ page shows the brand off for all its beauty. The page is lavished with stunning imagery and an authoritative voice. This globally recognised luxury motor company knows its buyer persona isn’t exactly looking for mega deals and day-to-day practicality. Their target market is looking for something special, so the content reads more like a drama script than a sales page. Visitors are taken on an elaborate tour through the companies quality craftsmanship, rich history, and most notable achievements. This is a fine example of long-form page content at its best. 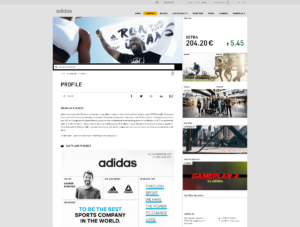 The first impression you get from the Adidas ‘About Us’ page is that it’s designed for investors more than anybody else. The page sells core stats and achievements but also hits pretty hard on company culture. The content itself speaks directly to shareholders, while the design and aesthetics play a key role in ensuring the page remains easy to digest and attractive to consumers. If you want your ‘About Us’ page to serve different groups of viewers with a more tailored approach you can take a leaf out of CRFs book. 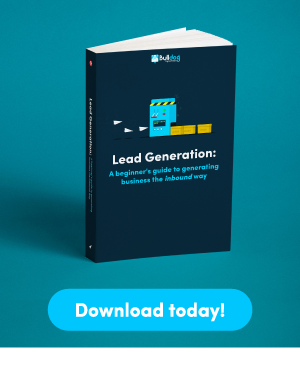 These guys offer a panel of options at the bottom of the page that pull different types of visitors to content that is tailored to them. There’s a call-to-action for startups, another for investors, and one aimed at third-parties. 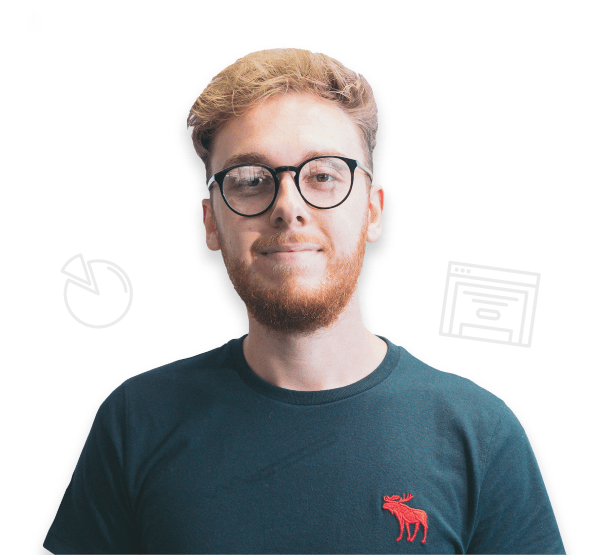 By separating your visitors you can personalise content to suit their precise needs instead of trying to please everyone with one chunk of text. As you’d expect, Twitters ‘About Us’ page is big, bold, perfectly mobile friendly and incredibly simplistic. 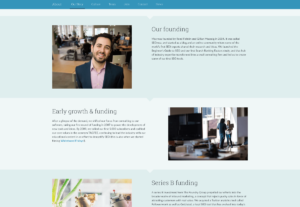 Feel like creating an ‘About Us’ page that’s as dynamic as they come? This is how it’s done. For the world’s largest network of clever comments where every word of every statement counts, a typical paragraph explaining the company’s path and history doesn’t quite cut it. Their new page is simplistic, striking, and undeniably beautiful for these reasons. 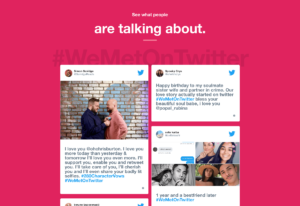 As you scroll down the page, you’re taken on an elegant journey through the brand’s most impressive recent events, as well as mega tweets from some of the networks highest-profile users. No culture selling or milestone bragging is actually necessary. The layout and design do all the talking – Twitter leads the world in social news and that’s not changing anytime soon. What can we take away from this? If you want your page to be very elegant and think your brand stands for brilliance, innovation, post-contemporary living or all of the above, you can follow Twitters style and construct a compelling ‘About Us’ page with less than a couple hundred words. People always naturally connect with storytelling. Having a great story about your brand is a powerful way to get your target viewers emotionally connected with your company. What Moz has done is very interesting. They’re leaders in the SEO technology space, so you might expect them to have an approach that’s very “too cool for school”. Actually, the brand paints us a more evoking story about their belief system, the way they perceive the future of online marketing, and the benefits that customers have gained from utilising Moz products. By connecting the brand to passion and righteousness, they’re shining a light directly at the true culture behind their brand. Evidently, the most important objective that Moz has is to be perceived as the guys leading the “good fight”. This is a masterful way to position its products as superior while simultaneously building a character for the brand that’s more in-line with caring and nurturing than gloating about being top-dog. Those are our favourite 7 ‘About Us’ pages right now. One thing is very clear, company culture is often a core priority for many of the world’s market-leading brands. Whether you intend to go simplistic or long-form, dynamic or traditional, the main thing you have to portray from the off is how your company likes to go about its business. This page is one of the best opportunities on your site to express your brand’s true identity – make it count by expressing belief systems that your target personas will adore.